Sampled from 0.33 l bottle from local 'toom', best before November 2018. Clear, golden amber with a medium large, frothy, slowly diminishing, white head. Sweetish, slightly grassy-spicy aroma of grains and some straw. Slightly sweet, moderately bitter, gently grassy-spicy taste of grains and some straw, followed by a short, moderately bitter, slightly grassy-spicy and a bit watery finish. Thin to medium body, slightly effervescent mouthfeel, soft carbonation. Nothing special at all, average Pils. 0,33 l swing top bottle. Clear golden with a big white frothy head. That´s what you can expect from a german Pilsener. Smells low grassy. Taste starts grainy grassy, some decent bitter hop, hints of citrus in the background. Above standard carbonation. Nothing wrong for its kind but also only average german stuff. Bottle. Clear yellow/gold with a decent head. Aroma of earthy German hops. Minerals. Taste is earthy, bready, grassy, slightly spicy and metallic. Pretty strong carbonation. Very süffig. 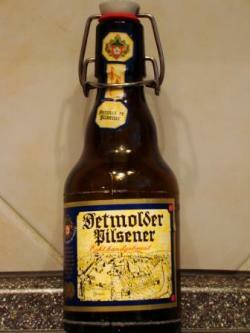 Ordinary Pils from northern Germany. 0,33 l Bügelflasche. Aroma: hopfig, grasig, leicht herb. Erscheinung: Hellgelbes Bier, etwas grobporiger Schaum. Geschmack: leicht Süß, leicht säuerlich, etwas bitter. Nachgeschmack: Säure kommt kurz auf und geht dann, Süße und minimal auch die Bitterkeit bleiben. Gesamt: solides Pils ohne große Schwächen. The Color is nice golden. Foam stays realy long in the glass. One can smell the hops aroma. despite the gop aroma it tastes like hay and grass. Realy nice from the beginning to the end. The bitterness is realy great at the end. 22-Feb-2016-0,33L Flasche. Gelber Körper, klar, weisser stabiler Schaum. Aroma: Getreidig, grasig. Antrunk. malzig, recht süß, schwach hopfenbitter. Recht üffig. Heldere citroengele kleur met een goede kraag. Ruikt mout, citrus, hop. Smaakt fruitig, bitterzoet, hop,citrus.